I arrived in Athens accompanied by a flight full of Greeks from Melbourne making their annual pilgrimage to the islands of their youth. After listening to conversations that criss-crossed the plane in that peculiar antipodean version of Australian Greek, peppered with Ozzie slang and words in English with the Greek endings, I was in a state of exhausted anticipation. However I managed to find my way via the Metro to my Hotel in Plaka and somehow my energy returned. I needed to seek out my temple, the PARTHENON. 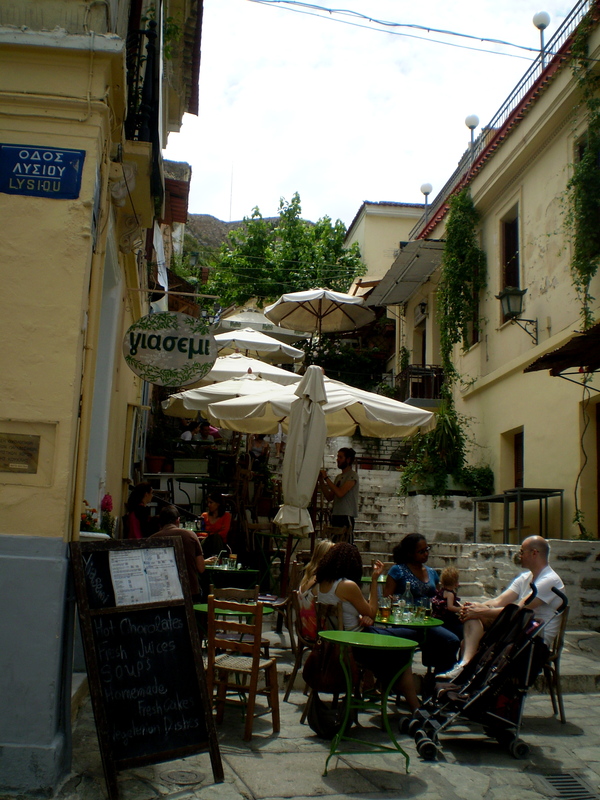 Walking through Plaka’s seedy but somehow charming streets, passed hawkers and markets full of trashy goods and hopeful shopkeepers I abandoned the map and chose one of the many marble-paved lanes that headed upward to the Acropolis. with only a few tourists in sight. Then looking up to see what appeared to be a giant wall, columns peaking over it, what is that? Many steep steps in narrow lanes all leading up, following a wider path not wanting to look up to my left, that must be it, it’s so large,steep, high, a mountain of a rock but where is the PARTHENON? The Acropolis, the Uluru of Western Culture, and I felt like I was an ant, my cloak of knowledge abandoned, falling off. 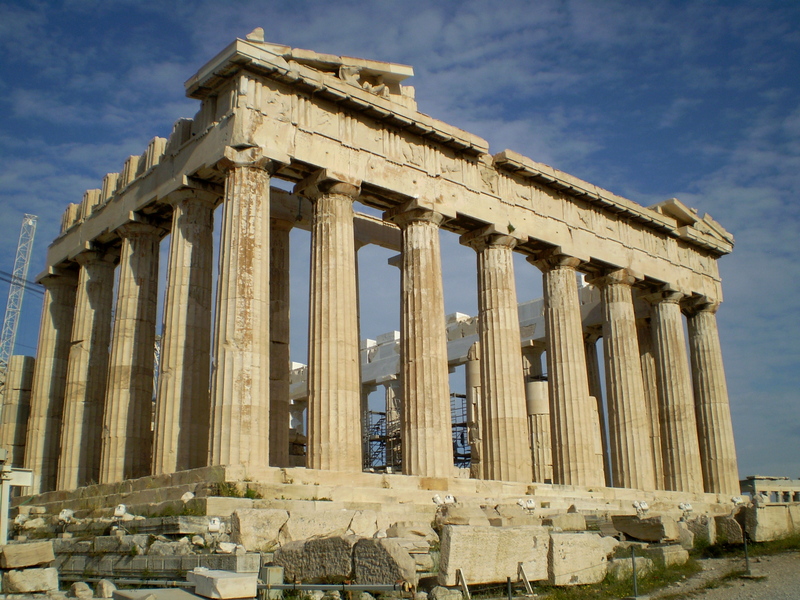 I tried not to look at it, maybe this was not it, and maybe the PARTHENON doesn’t even exist except in my imagination. I stopped to listen to a lone Greek player of a kind of medieval lute or sitar, soft sounds in a minor key as I sat beside him on the pavement. I hummed the chords quietly, we talked slowly with him respecting my meditative state as he waved away people who tried to take his photo. I felt my heart opening, breaking at the same time, saying at last I’m Home. I said goodbye to the slim fine-boned intelligent man whom later I would call Dimitri as he became my friend and guide. He stood and shook my hand, thanking me for stopping and sitting beside him. No-one ever does that, he said in perfect English. Was he Hermes the Divine Messenger? The smog was lifting and the sun shining more than I expected, the pink white rows of houses and small apartment blocks sparkled from this distance, their shabbiness turned into jeweled boxes as I looked across the plains of Attica. I realised as I looked up again at the rock, it felt like the backside of the Acropolis with just a hint of columns above what appeared to be giant city walls. No wonder Pericles chose this place on which to build his monument to the glory of the Athenian Empire! As I reached the car park and tourist office I could see the magnitude of the rock, it truly was a fortress. I bought a 4 day ticket and withdrew as tourists swarmed, not wanting to join them. I wandered into the Pnyx, hurried off the wider path into narrow tracks in the bush, surrounded by ancient debris, feeling the presence of the past, still hardly daring to look up to my left towards the PARTHENON. Seeking shade and solitude. Found the prison of Socrates, caves in a rocky outcrop with bars across the interior,wondering how it was for him as he waited to take his poison receiving his students and friends all of whom were offering him escape in exile which he refused. I wanted to climb up the rock to get a better view but could not, I crouched behind a bush to have a pee hoping the cops on motorbikes don’t see me. At last I lay down exhausted, my view of the Acropolis and its elusive temple obscured by the fir trees scattered among the pine cones. I sat down with my back to a tree and then I saw framed in its branches the unmistakable PARTHENON, hardly daring to look at it as if its shining might blind me like Tiresias. I had no camera with me to capture this first image, the photo below was taken at 8am the next day when I was alone on the Acropolis except for a few workers. Now the sun was at its zenith, no clouds, bright bright blue sky and here I am, am, am. Tears coursed down my face, my whole body shook with joy, relief, pneuma, knowing, gratitude and awe. I lay there and the only words that came to me were, now I can die. I’ve seen all I want to see, if I die now it doesn’t matter. Transcendent was the word that came to me later as I encircled this experience and found more and more places to catch this image and blend it into my psyche forever. I sat upon a rock nearby while my image of the corner of the PARTHENON grew and grew, shone and shone, two long thin cranes appeared like beacons above this wounded cultural icon of the West, here at last we were restoring Pericles’ vision of the embodiment of sophrusune/balance after centuries of pillage,theft, misuse, war and pollution – or was it just as it should be with its complex history still present? I hoped the restoration would not result in it becoming a plastic caricature of itself. I tried not to load it up with concepts and kept coming back to my body, exhausted, tingling, awake, aware, feeling ‘zoie’ divine breath, everything in my life that had led to this moment , an older woman, ‘xseni’ foreigner, from 9000 kilometres away, guardian of the temple, Athena inside me, calling to passers-by ‘Ela etho’, look up, stand here, they obeyed and thanked the strange woman lying on the ground as if I must somehow belong here. I can still feel that moment within me, it is enshrined forever no matter what ugly and sad realities I must inevitably encounter here and elsewhere on my journey. When I got married in 2006 I brought my wife to Italy for our honeymoon. I’ll never forget that . . . . . . Thank you for your comment I think this augers well for your relationship that your wife was so moved by beauty and history, and that you will never forget it. I too have been to Orvieto and marvelled at the Duomo.I did not cry there but I did cry in a wonderful old Benedictine church in Florence where the mass was sung four times a day in five parts by lay clergy who cycled to the Church to don their white gowns and sing like angels. The congregation joined in and I was moved to tears each time I went there and sang with them. I’m not a Catholic but this was beyond religion, a unifying spiritual experience, just as my experience of the Parthenon was.